The Shannons Nationals enters its fifth round for the season, heading north to race at Queensland Raceway for the first time in 2017. A big weekend lies ahead, with fan-favourites set to excite fans at the Ipswich circuit. 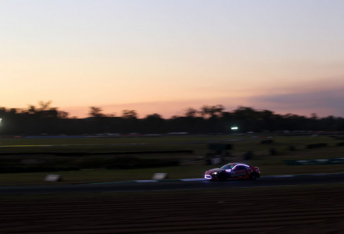 The spectacle of night racing will be a highlight for the weekend, with the Australian Production Car Series running their famous ‘Fight in the Night’ race – a 25-car field set to put on a fantastic show with great racing and fancy light displays. Following on from his own recent success at Queensland Raceway, Supercars star Chaz Mostert returns to the series this weekend with Nathan Morcom, who will both looking at regaining crucial points under lights after missing the last round at Sydney. Bob Pearson put in a strong performance at the previous round, taking all four race wins and celebrated with a ‘shoey’ on the podium. This round also marks the final race in the Porsche GT3 Cup Challenge’s Jim Richards Endurance Trophy, with Porsche Junior Jordan Love the favourite to take the honours in the 40-lap endurance race. The battles in the series will also extend to the Elite class, with four points separating Sam Shahin and Anthony Gilbertson. CAMS Australian GT Trophy Series also returns to the Nationals’ schedule this weekend, with a record-field fronting the Queensland circuit, featuring some of Australia’s most exotic race cars. The field is joined by the popular MARC Cars, with the V8-powered pocket-rockets racing at their home circuit for the first time this season. Finishing positions will be crucial for racers in the Australian Prototype Series, in what is arguably one of the closest national series battles in the country. Just 71 points separate the top six cars in the series battle, which has featured different round winners at each round to date. Philip Hughes currently leads the charge, but is closely followed by Mark Laucke, the winner of the Sydney race. This weekend the Nationals’ will host an invitational round of Series X3 Queensland, the first time any state Hyundai Excel series has been on the calendar. Featuring the biggest field of the weekend with 33 cars, the battle will be on for young and old, racing on the national motor sport stage.